Just because a lot is large doesn’t mean it’s worth big bucks. I came across a vacant parcel that is nearly one-acre in size in Sacramento County, but it’s priced at only $2,000. No, that is not a typo. I thought this would be a perfect example to help us consider a few thoughts on the value of land. When reading about a lot that is 0.88 acres and only $2,000, it seems like a no-brainer to purchase. Yet when looking at the plat map, it’s obvious the lot might have some issues because of its location (it is sandwiched between 20 houses to the west and east), shape (it is really thin) and potential use (it is listed as a drainage channel in Tax Records and might not be suitable for any building). Bigger Isn’t Always Better: The example above is of course extreme, but generally speaking most buyers do want more space and will pay higher amounts for a larger lot. For example, I appraised a house in Land Park recently that had a “double lot” (which actually means 1.5x lot), and there was a hefty premium for the additional size and location. However, there are also many reasons why a larger parcel may not necessarily evoke a premium in the market. Why? If a lot cannot be built on or used for something constructive, it’s not good for much, right? If a lot is located next to a busy street, railroad tracks or some other adverse location, it may sell for less than a smaller-sized parcel with a better location. Additionally, if a lot has a steep slope or some sort of easement that makes much of it not useable, this can definitely impact value. Definition of Highest and Best Use: The lot above is the perfect scenario for talking about the concept of highest and best use (HABU), which is something appraisers have to think through for each appraisal – whether it is a vacant lot or improved site (house, commercial property…). Real estate text books describe HABU as follows: Highest and best use is that use which is legally permissible, physically and reasonably possible, economically and financially feasible, and which results in the most profitable of the alternatives. Highest and best use considers current zoning, location and size of the site, surrounding land uses and development characteristics of the market area. 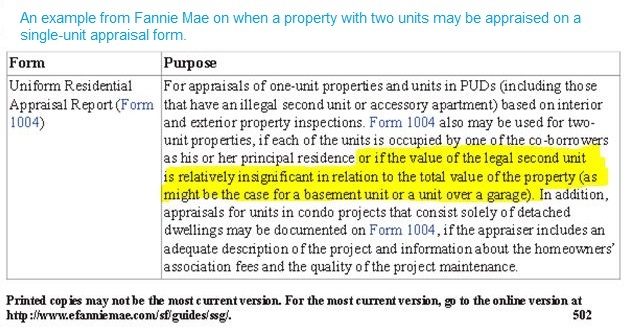 Highest and best use is that reasonable and probable use that will support the highest present value as defined as of the effective date of this appraisal. Purchase and then sell smaller chunks to neighbors. Build a very thin park. Low-cost tent camping for vagrants (imagine what neighbors would do). Wetland mitigation (get paid by the government to own this parcel). Question: What else could this lot be used for? What is #11?